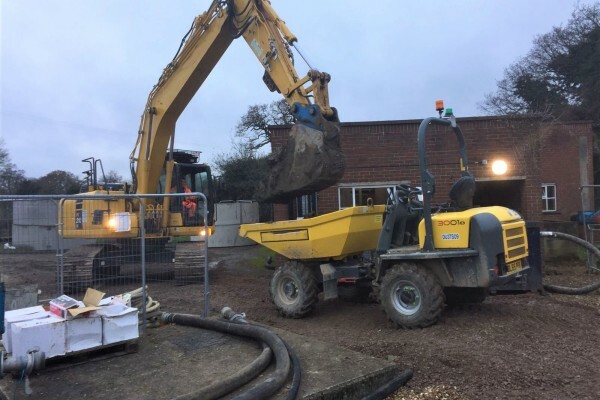 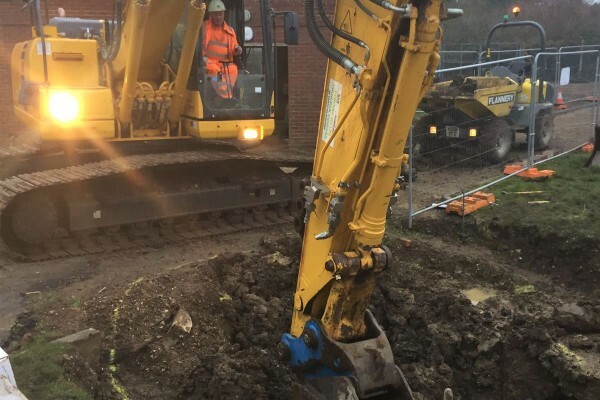 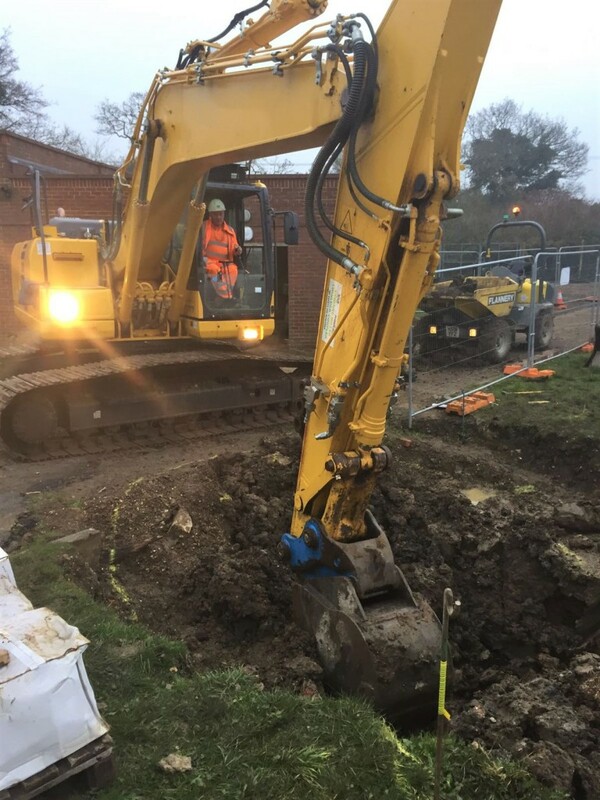 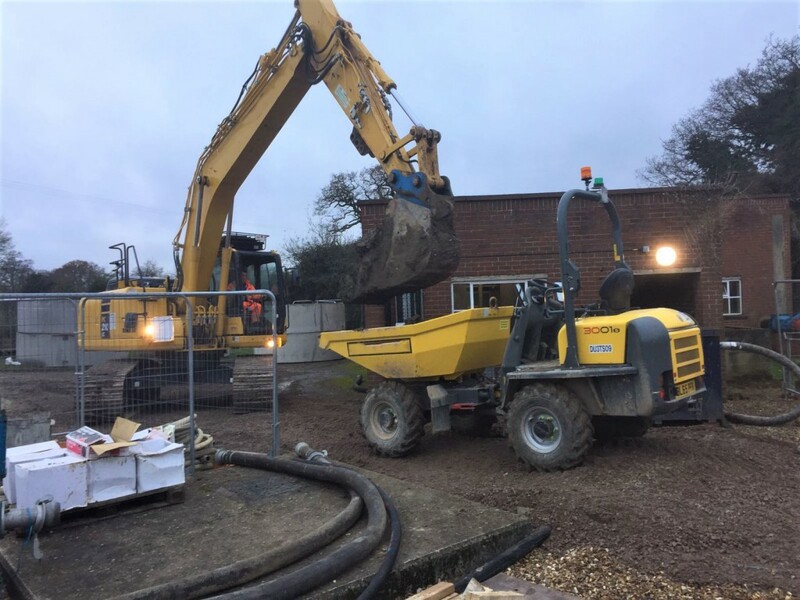 With a duty to maintain the existing water infrastructure, and expand capacity for the future, Thames Water engaged The Trenchless Experts, Terra Solutions to upgrade the Waste Water Treatment Plant in Wokingham. 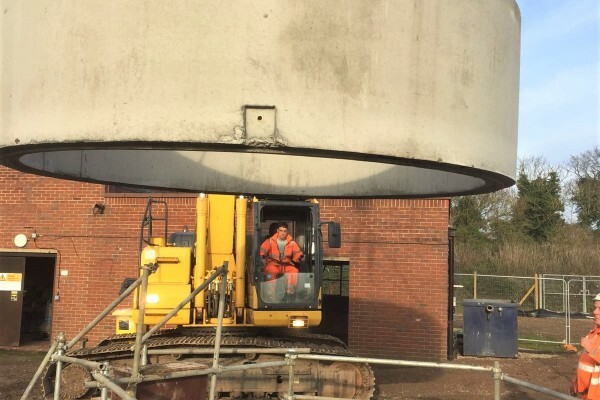 Serving 11,000 people daily, this plant was in need of modernisation. 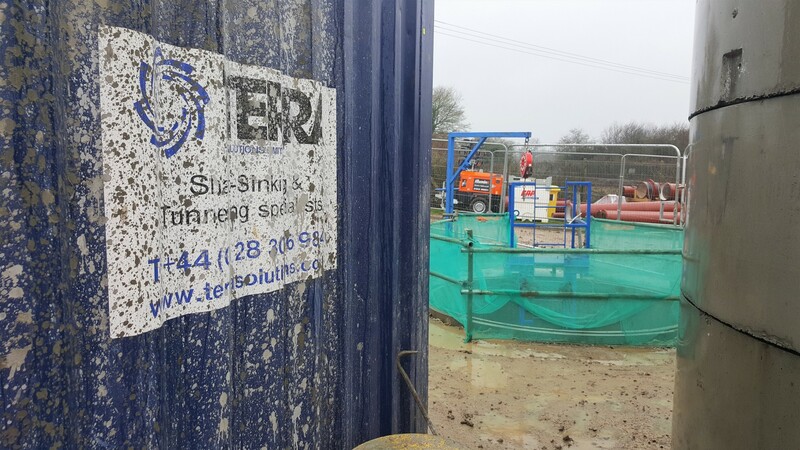 Terra Solutions were engaged to construct- through shaft sinking- a caisson shaft 3mø at a depth of 10m to serve as a new inlet chamber as well as the new wet well and valve chamber for the system. 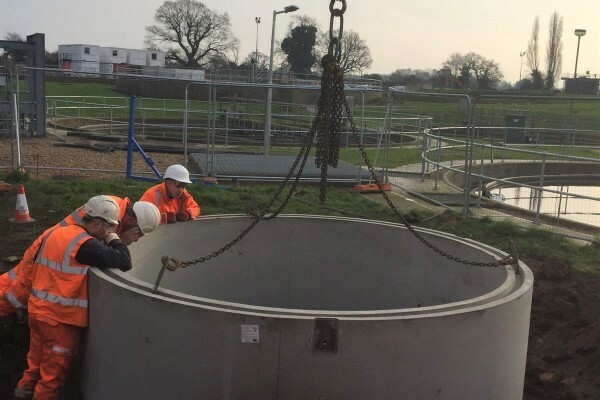 The job did provide a number of unique challenges, largely stemming from the age of the waste water treatment plant and the environment. 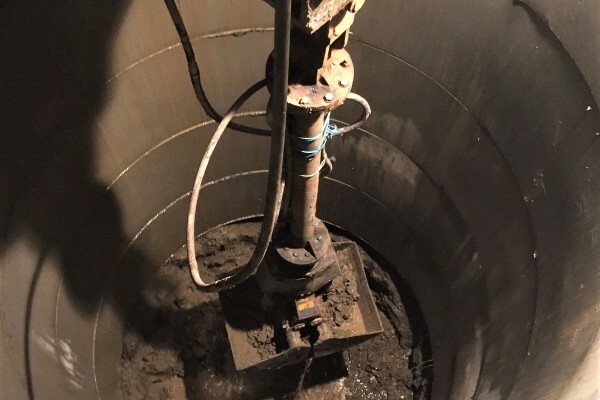 As such there were miscellaneous materials present in the earth that could not be accounted for through borehole exploration, which provided a few surprises as the job progressed. 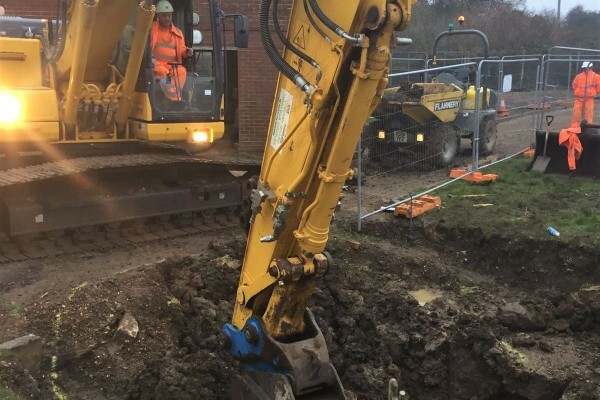 With pipework of this vintage there is always an increased risk of asbestos, requiring vigilance from all staff. 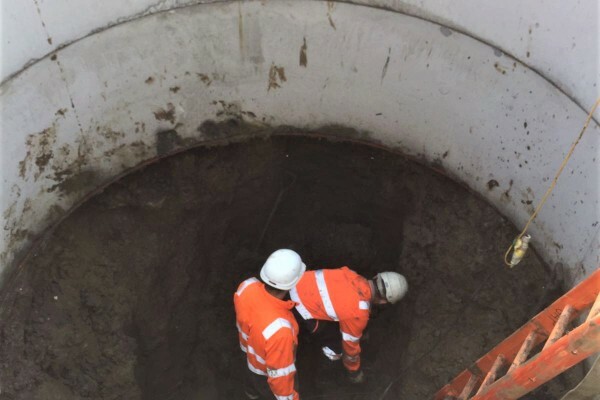 To begin with, Terra excavated a hole of sufficient size to build the cutter choker and install a concrete collar. 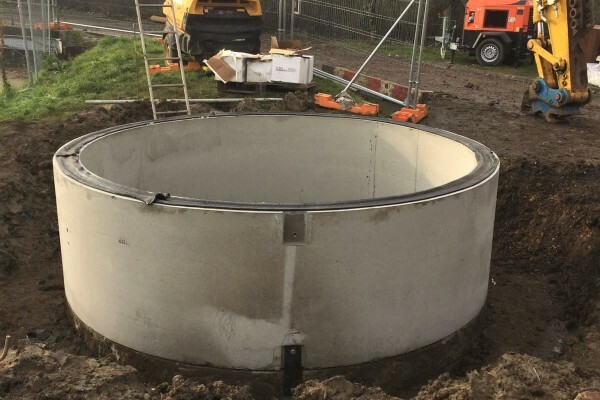 Sufficient space was left to install the 1000mm x 1000mm concrete collar around the outside of the segments. 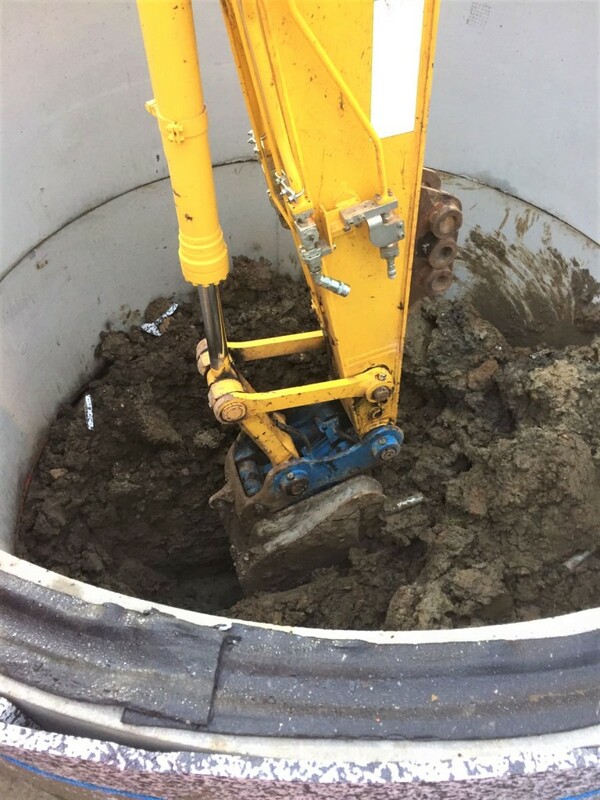 This concrete guide collar was poured and allowed to set around the 1st rings. 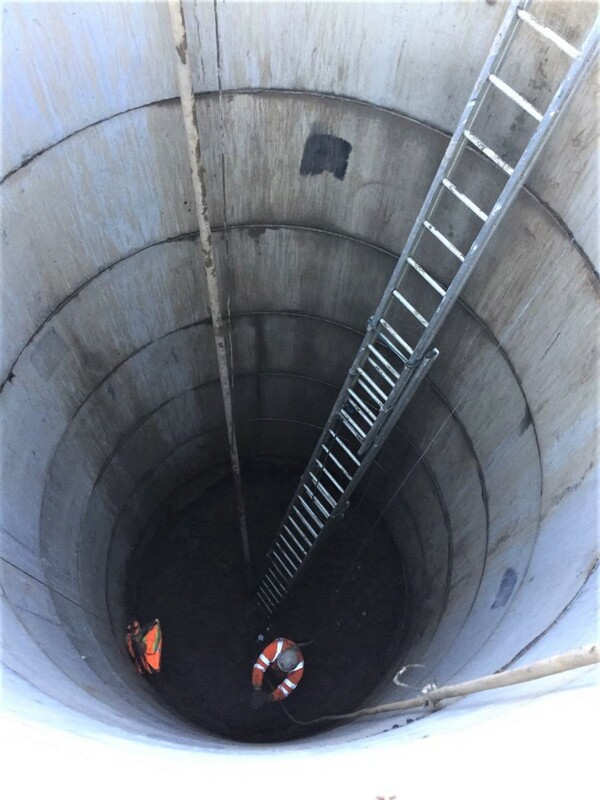 Before the concrete set, scaffold poles were placed to form a handrail around the shaft and act as edge protection for this shaft. 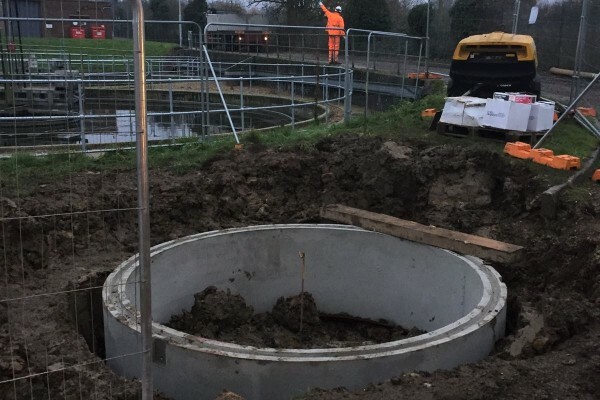 The cutting shoe & base ring were constructed, and a second ring was placed on top. 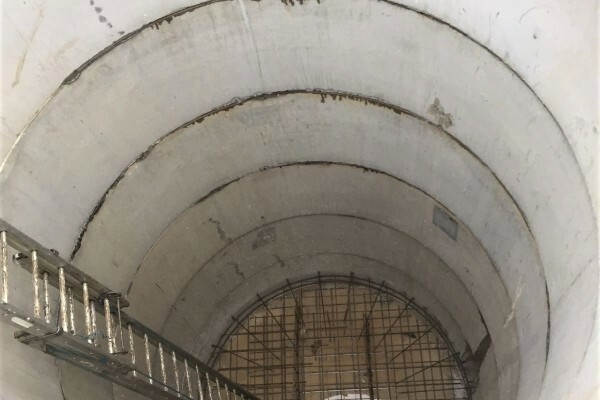 The second ring provided the necessary additional height to hold back the concrete in the collar, acting as an internal shutter. 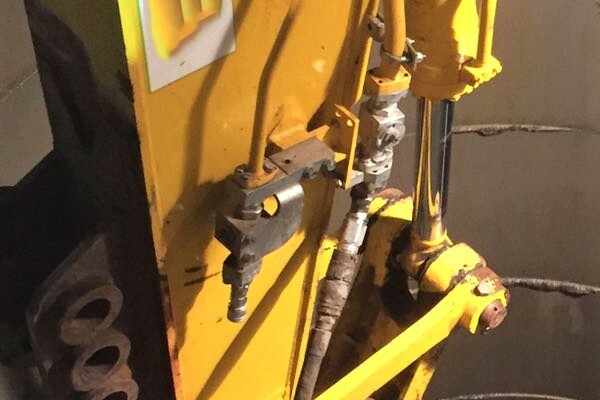 Once the collar gained adequate strength a third ring was built, and subsequent rings provided the additional weight necessary to allow the shaft to drop under its own weight, removing the need for hydraulic jacks. 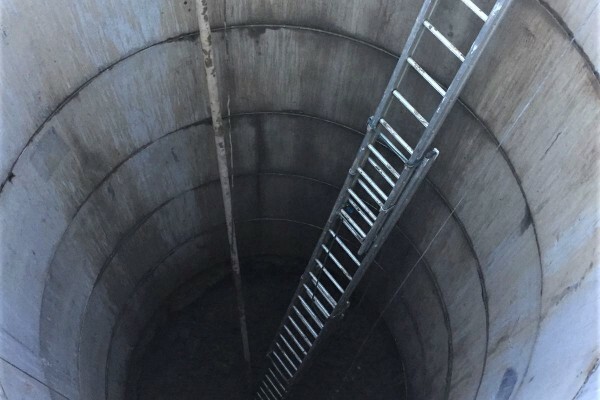 This is known as the Caisson method of shaft sinking. 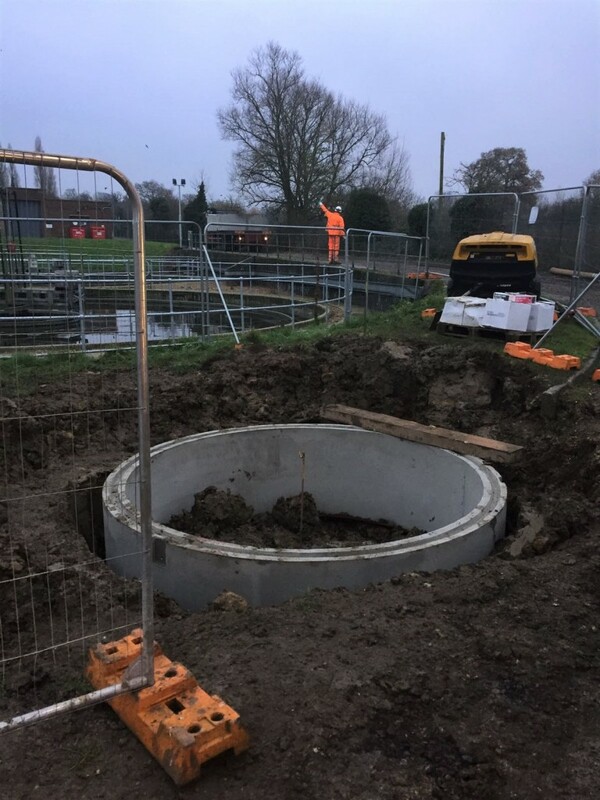 The cutting shoe & base ring were surrounded by a polystyrene wrap- known as an annulus- so the shaft was free to move once to concrete had set/cured. 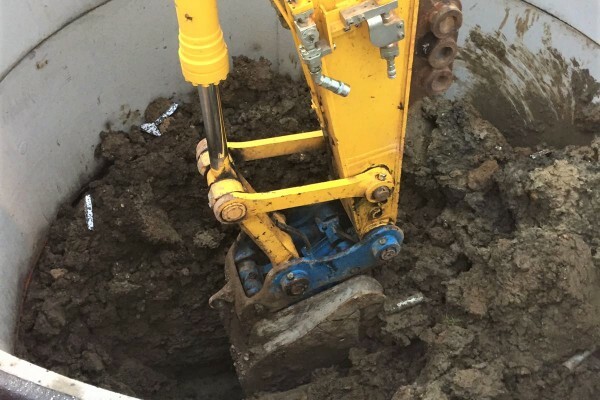 Terra Solutions excavated the ground within the shaft in a controlled and methodical manner, the object of this being to avoid the excavation of any one area more than another. 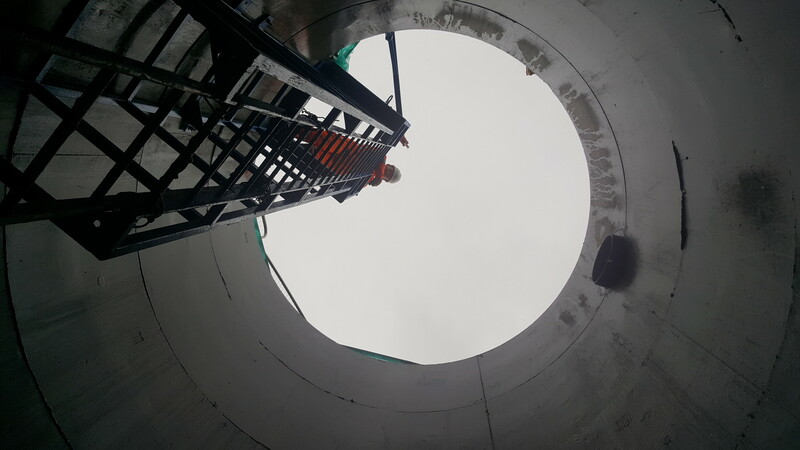 As the shaft began to move the next ring was constructed on top of the previous rings. 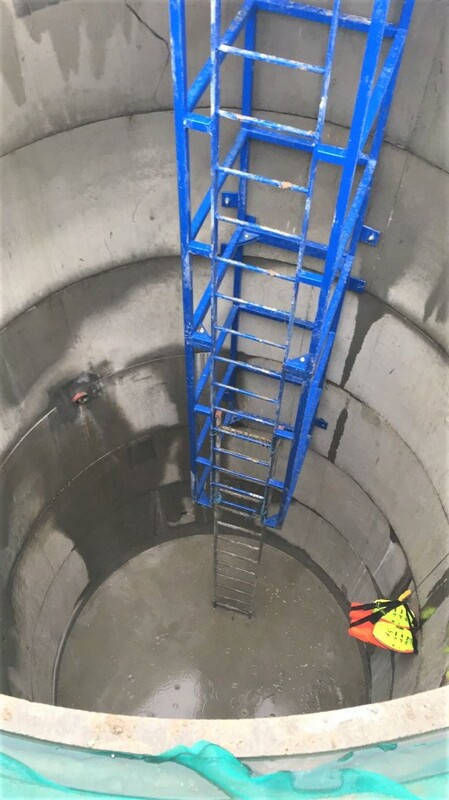 Safety first: guardrail, safety ladder and davit arm all present and correct at the top of the shaft. 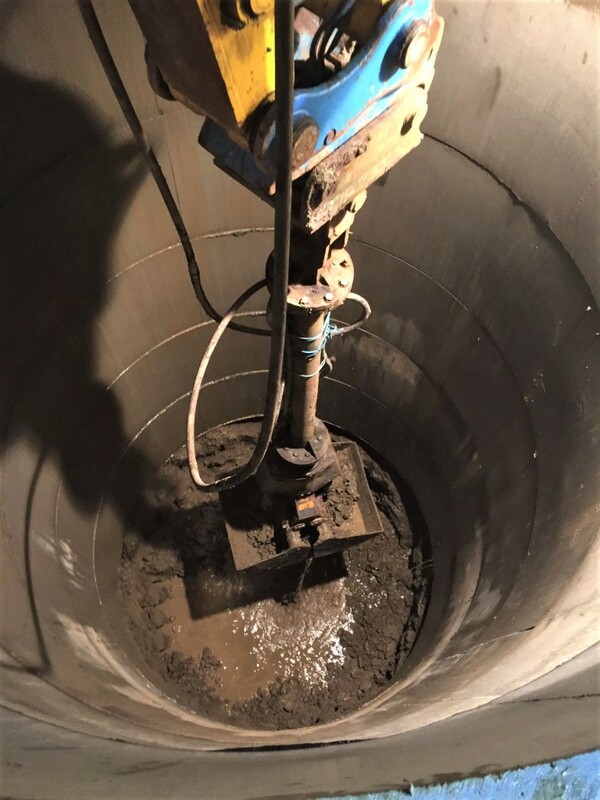 Once the excavator was out of reach with its bucket, a hydraulic clamshell grab was fitted so that Terra could gain the extra arm length needed to continue excavating the bottom of the pit in the required fashion. 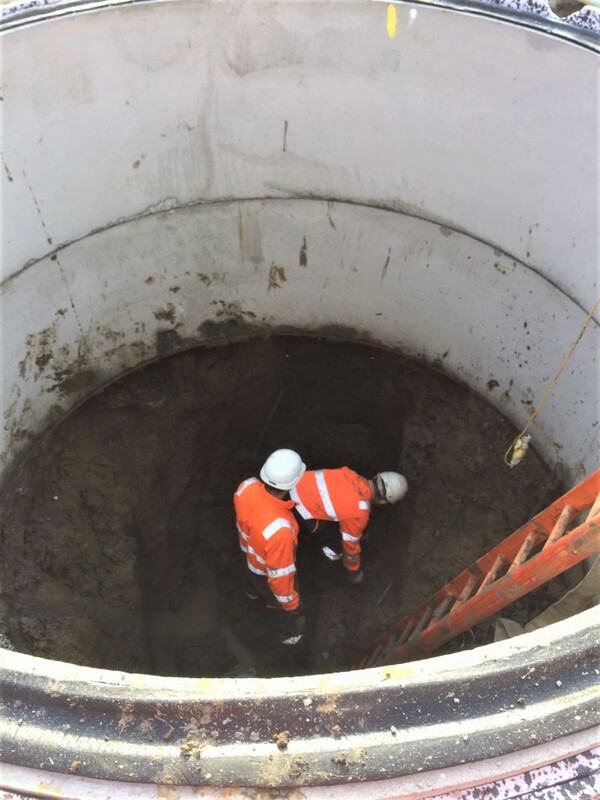 As the shaft was being constructed it was necessary to lubricate the segments to reduce ground friction around the perimeter of the shaft. 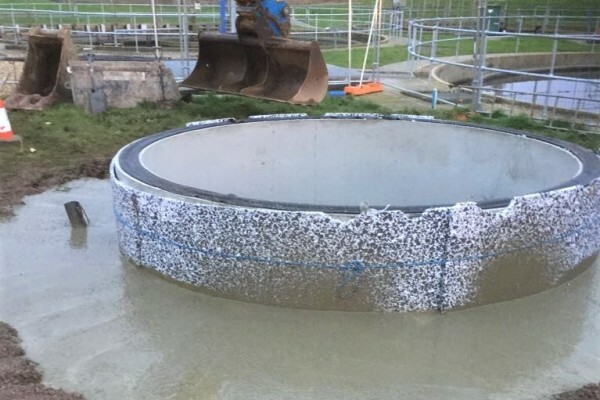 Terra Solutions utilised a Bentonite based lubricant, mixed in an air operated paddle mixer and pumped into the annulus which was created by a polystyrene wrap, which broke the bond between the rings and the collar. 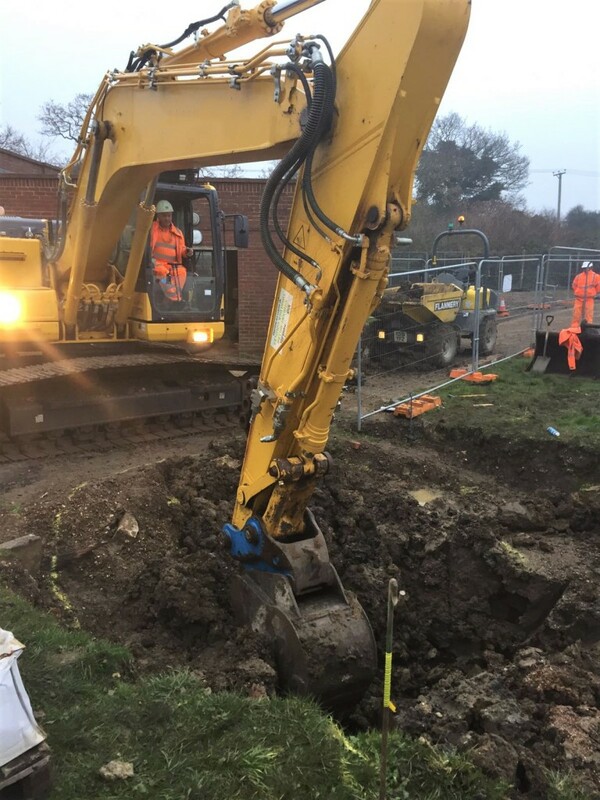 Any hard ground or obstructions encountered that threatened to affect the shaft’s alignment or halt its downward motion, had to be excavated by hand using vibrating air picks or clay-spades. 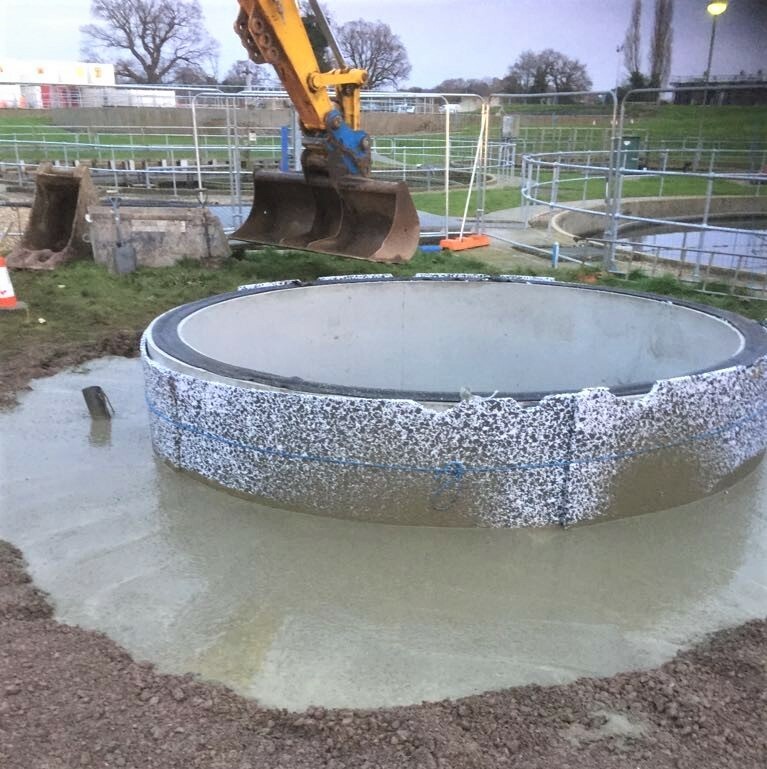 Rings were placed on top of each other and lubricated with bentonite in a repeated manner, until the required depth of 10m was reached. 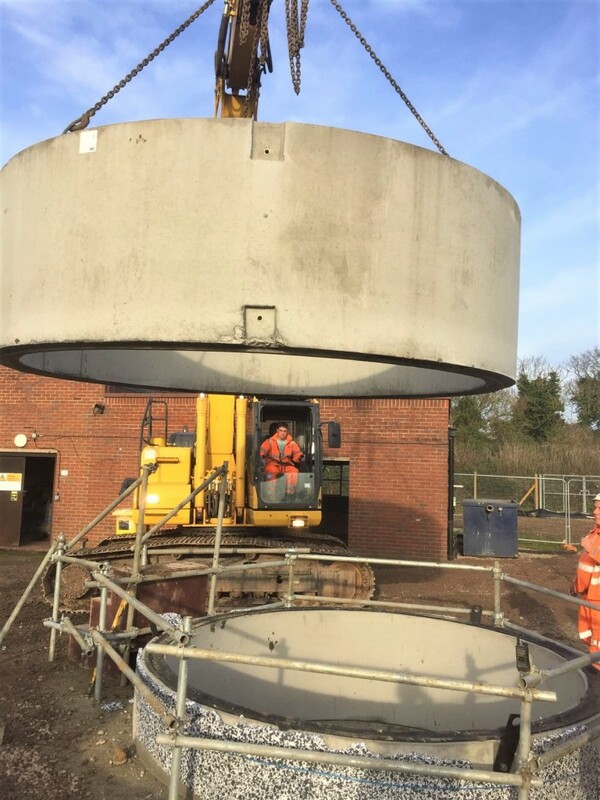 When the correct depth was achieved, a 3m deep concrete plug was poured using a concrete pump with a 24m boom. 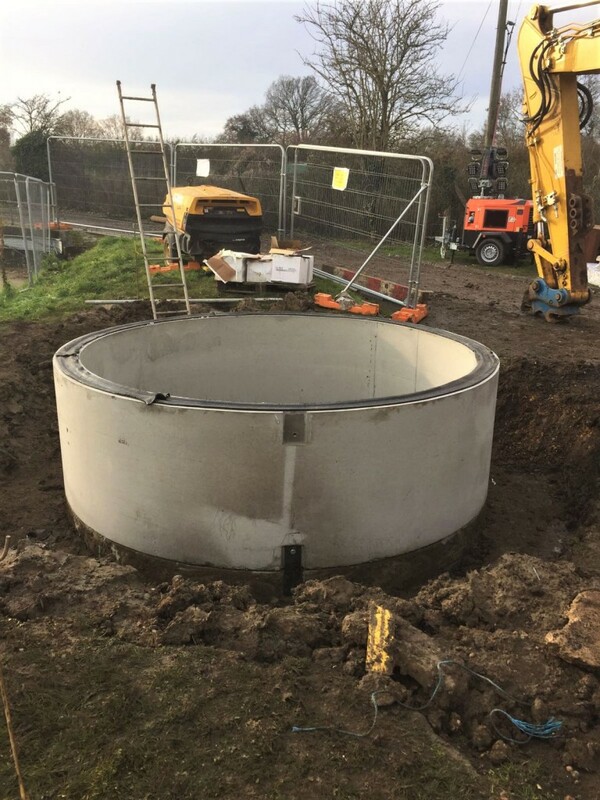 A reinforced base was tied and dowelled to the shaft walls to create a 500mm thick reinforced The concrete for this was lowered to bottom of the shaft using a concrete skip with a geared discharge chute. 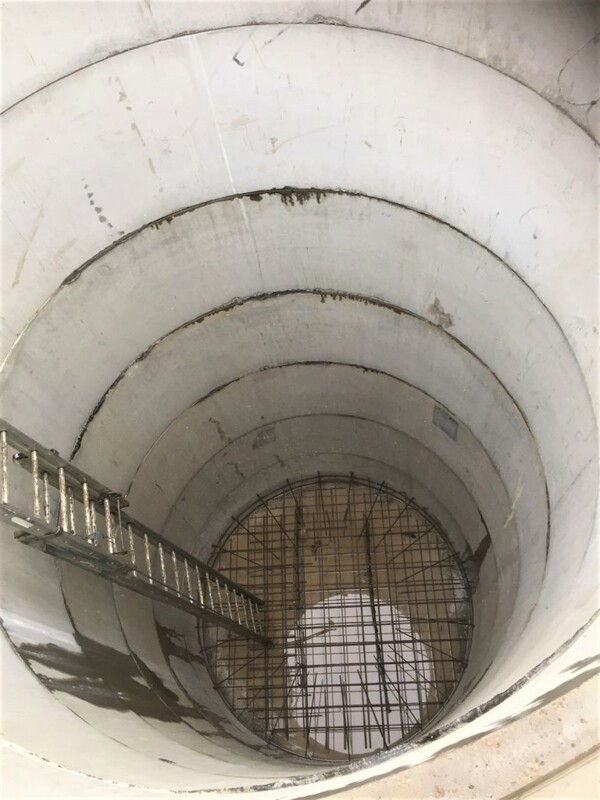 At this point the base and the walls of the shaft formed one solid, concrete structure. 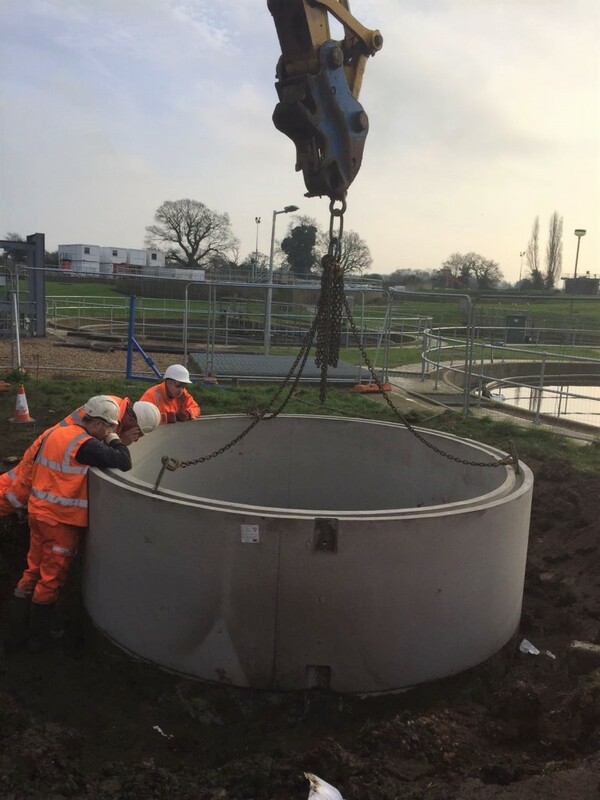 Any water that did ingress was dealt with using a 2” submersible pump. 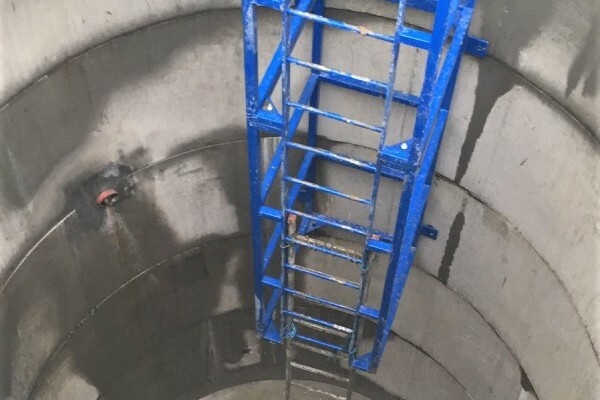 The annulus behind the ring segments were grouted using an expandable grout gun, starting from the bottom of the shaft and moving upwards, maintaining the structural integrity and preventing future ingress. 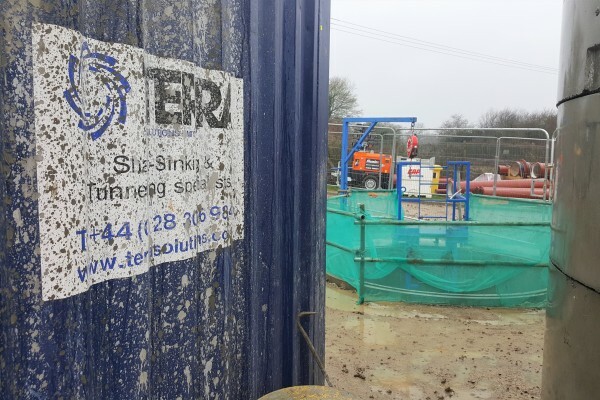 Terra Solutions constructed the 3mø Caisson shaft successfully, despite the age of the existing works and the challenges presented by the London Clay terrain.